Writer Sanctuary and Writer Support - Blog What do you want? What will you write? 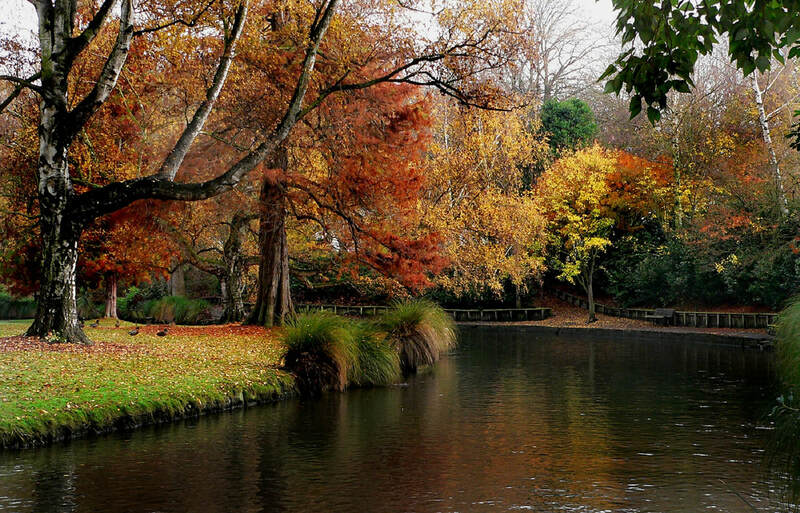 Christchurch was my home not four months ago. And recently it has been a world news headline once again, with a mass shooting taking place in the CBD. It's devastating to see such violence and hatred within the city where I was born. There's been plenty said on the matter, and there will be plenty more said. So I shall keep the things that are on my mind very brief. I love Australia, and I love New Zealand. They are both my countries. As a dual citizen who has had many happy memories in both countries, I can say that with perfect conviction. So I'm properly grieved that this happened in New Zealand and that it was an Australian who perpetrated the attack. There's been a great deal of insistence that "this isn't New Zealand" and "this isn't Christchurch". I would also like to say that this isn't Australia. And fourthly, despite whatever Tarrant might have said in his manifesto, this is not Christianity. Perhaps Tarrant had some links to Christianity. He certainly made a great many excuses to justify his actions. But this is not the face of Christianity. First and foremostly, true Christianity is not a white supremacist thing. It's a walk of life that spans all nationalities over the world. But if you want to be picky, it began in the Middle East, where Jesus Christ associated with the Samaritans, the tax collectors, and the "sinners" of his day - people whom the religious leaders despised. And then He gave His life for them and many others, before being resurrected and striking death its final blow. Christianity is about compassion, generosity, grace, and new life. True Christianity has ministered and always will minister to the vulnerable. As I write this, I know that there will be Christian brother and sisters of mine, over in China or Pakistan or other countries overseas that will be suffering intense persecution. My husband and I support a missionary group in Pakistan, and we frequently hear of Christians there who have been abused, tortured, and even killed because of what they believe. So Christians know what it is to be persecuted. And I hope that true Christians will stand by Christchurch and the Muslim victims of this attack in this time, because of that knowledge. True Christians should empathize and be compassionate. One thing that I've seen is a lot of people encouraging others in New Zealand to wear Muslim head scarves, to show their solidarity with Muslims in this time. I personally feel that perhaps this isn't the most helpful thing we could be doing right now. If a gunman had walked into my church and shot dead a group of Christians, I should feel uncomfortable if the government or another group requested that everyone wear a cross in solidarity, or that everyone get a T-shirt that says "Jesus is the only way". The fact is, not all of us believe what Muslims do, just as not everyone believes what Christians profess. And the response to this catastrophic event should be respect for religious freedom, not necessarily requests that everyone should wear a head scarf. In the light of this, people should affirm each other's freedoms to seek out the truth for themselves and to think what they wish to think. This is a fundamental human right. Secondly, those who are able should help the victims in more practical ways than donning a head scarf. Making meals for those who have lost a loved one, for example. Walking with Muslim women who are too afraid to leave their houses after the attacks. Offering company to those of the Muslim community who need it. Offering rides to those who would prefer not to walk the streets of the CBD at this time. Writing cards expressing your sympathies and well wishes. Praying for the victims of the community (for this event has highlighted the importance of freedom to pray). But whatever anyone does, it should be a practical sign of love and compassion for others. The resounding message should be that we are all human, no matter what we believe, no matter where we come from. And we ought to love each other and reaffirm each other's human rights. Anyhow, these are the thoughts of a Kiwi in the Australian outback at this particular time. I shan't be wearing a head scarf on Friday, because I believe in freedom of belief for all - Muslims, Hindus, Christians, and all other religions alike. But each night, I remember Christchurch and all the Muslim victims of last Friday's shootings in my prayers. I particularly think of the family of Mucad Ibrahim, who was only three when he was cruelly shot. And I pray New Zealand will see better days as the horrible fresh pain of this event begins to subside. 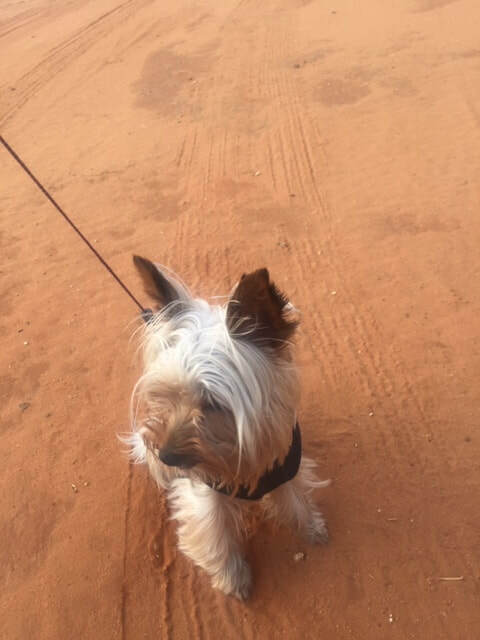 Taking Peyton for a walk in the red land. It's been a while since my last installment on our Australian adventures. We are gradually getting used to life here and enjoying it very much. There are always new challenges, but also new joys. I don't think I'll ever get tired of watching bats fly against the orange sunset. It's an unusual and yet fascinating sight. One thing that I have almost forgotten with the ordinary and enjoyable day to day life here are the many adventures and complications that brought us here. What I mean, of course, is that immigrating isn't an easy thing. We seem to have fallen on our feet on the other end. Good jobs, wonderful people, a great church, a good community. It's not everyone's experience. The journey here wasn't quite as smooth and was filled with a huge sense of risk. For a start, being a New Zealander immigrating to Australia is a somewhat risky thing. There are many New Zealanders going back to the land of the long white cloud because they have run out of money. In simple words, they lost their jobs or never got one after immigrating, and the government here will not support any New Zealanders on Newstart. Unless they've been unemployed for years. Then to the best of my knowledge, they give you Newstart for perhaps six weeks. And after that, you're on your own again. So both of us giving up very decent jobs in New Zealand to immigrate to a place on a set schedule without knowing whether we would have jobs by the time our flights came around was pretty daunting. It was made less daunting by the fact that I am an Australian citizen, though. If either of us run into financial hardship, our income should drop below the threshold enough for me to get a little help from the government. So that is good. But it would be just enough for one person to live on. Better than nothing, but not necessarily everything needed in a tough time. Once upon a time, New Zealanders flocked to Australia in hordes. It was a land of better pay and opportunities for many. New Zealanders even used to be allowed to collect the dole here in Australia, well over a decade ago. Then the Australian government changed the rules. They allowed New Zealanders to keep living here indefinitely. But they cut most of them out of opportunities for citizenship. So many tax paying New Zealanders here cannot vote and cannot get income support while they are jobless. They are entitled to Medicare cards, but apparently (I've not ascertained how true all this is yet, but it's something I've heard) Australians still get more perks. Some New Zealanders insist they've been denied some healthcare subsidies that other medicare card holders have gotten. Who knows? Time will tell for us. It's still a privilege to be allowed to live here. We were advised quite strongly by a few people not to go, and I certainly did take that to heart. I never do something without worrying about it ten times first. But at the end of the day, both of us felt the urge for a big change. We made a decision that we hope will benefit us and possibly any children we have (who will be allowed dual citizenship because of me). The first step on our journey was to check what sort of teaching job my husband could get. As I'm self-employed, I need to build up my income over time. Not all Australian states accept New Zealand qualified teachers indiscriminately. For some of the states, you have to do a whole lot of extra paperwork to get in. So that narrowed down our choices. Originally, we looked at most of Australia - excepting Tasmania (too cold) and Northern Territory (too many crocs). Then we cut out the states that didn't offer mutual recognition for New Zealand teachers. That unfortunately knocked out New South Wales and Victoria. After that, it was a serious toss up between Western Australia, South Australia, and Queensland. We had our sights set on Adelaide for a while. Then we wondered about Perth - less hay fever and warmer seas. At last, we settled on Queensland somewhat reluctantly. The jobs were better around Brisbane, with more plentiful opportunities. 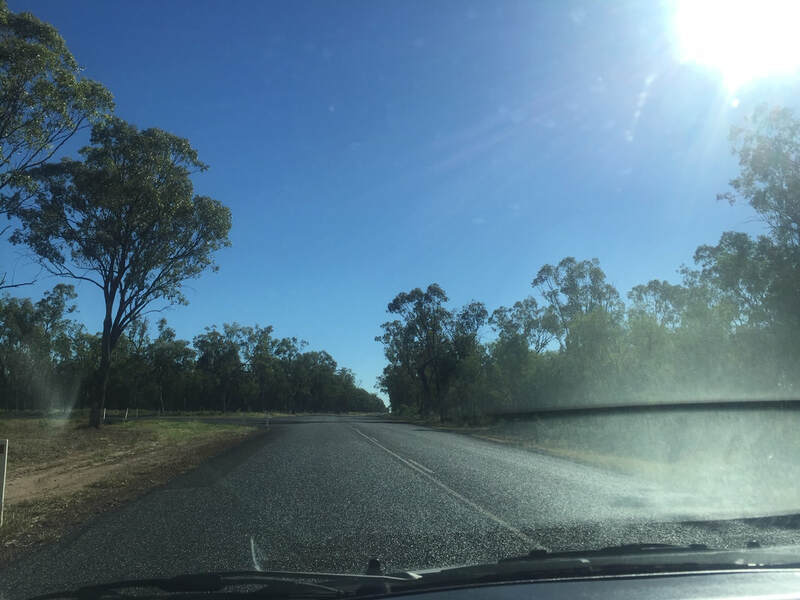 I was concerned about the humidity and the termites, which are sometimes worse in the North. We looked specifically at Brisbane but also looked at towns scattered around about it, which was how we came up with Chinchilla. A job at the Christian College was being advertised. Chinchilla looked like a great place to live - comfortable, cozy, and outfitted with everything anyone needs for day to day life (except a maternity ward, but thankfully people here don't pop out a baby every other day). Michael's mutual recognition had come through by the time he applied for this job, and he had paid for Queensland Teachers' Registration. It was quite extraordinary to see this all come through in the mail. So he emailed a few recruiters and applied for the Chinchilla job. He was accepted for the Christian College here relatively quickly. It was extraordinary that by the end of August, he had a job to go to, and we knew we were going to be financially okay in a new country. The relief was immense. We had already committed to immigrating (he had resigned from his previous job), so it was good to know things were looking positive on the other side. Much later in the year, the recruiters got back to Michael and offered him a potential position in Townsville (which is probably still partially underwater currently) or Mount Isa (which is so remote it may as well be on another planet). Chinchilla is probably the place for us. Besides which, Townsville has crocodiles, and I'm not quite ready to go level up on my Australian challenge yet. After Michael got the job, I was also offered work at the college teaching singing and piano. This meant a lot of paperwork for me. In Australia, everyone is required to pay for a blue card when working with children. It's like getting police vetted in New Zealand, but it's not free. It costs a decent amount every three years. So that was step number one. Then to get an ABN (Australian Business Number) and a TFN (Tax File Number) all so that I could get personal indemnities insurance. This is so that if I accidentally burn the school down, I'm covered for the damages. All this took quite a bit of time. We visited Australia in September and stayed in Chinchilla for a few days. Unfortunately, one of our first introductions to living in the town was viewing rentals in the newer areas of Chinchilla. It's not all bad, but it is worth saying that some places were built pretty quickly during a mining boom, and it does show. I felt thoroughly depressed after viewing a couple of places. I'm pleased to say our current rental (an older home) is a better fit for us. It's better built and more solid. Before we visited Chinchilla in September last year, I had this not-so-bright idea. If we bought a car, we wouldn't need to pay for a rental. So we bought a car, literally over the phone. It's actually an excellent car, so we were pretty lucky. But the major issue came when we wanted to drive it away. I didn't have an Australian driver's license or address, so I had none of the vital identification documents to register as the car's official owner - and most of my New Zealand ID did not count. A friend let us park our car at her place for two months while we were back in New Zealand prior to moving, and I had luckily put her address on the insurance documents for the car (which were hopelessly difficult to get from NZ as few companies wish to insure a car when the owners are still living in another country for a few months). So with the digital copy of my insurance statement and my Australian citizenship certificate, we pulled through, after about an hour of waiting at a government agency. My writer friend Russell Proctor kindly drove us to the government agency and then also took us to town where we verified my bank account in Australia. The Commonwealth Bank here allows you to set up from another country. But you still have to verify your account in the middle of a large city. However, it did mean we could transfer funds into our account before arriving, meaning we had money to spend. Without good friends letting us park our car at their place or driving us around in Brisbane CBD, we would never have made it through. After our return to New Zealand, we spent most of three months preparing to move and finishing up our work. We had originally chosen to leave our dog behind, but I wound up deciding I would miss her too much. The day before she traveled, we received an invoice for her flight, detailing a transit to Melbourne. That freaked me out, and I got on the phone really quickly. "Oh, it was just a mistake," the pet transporter told me, rather casually. "I meant to write Brisbane." 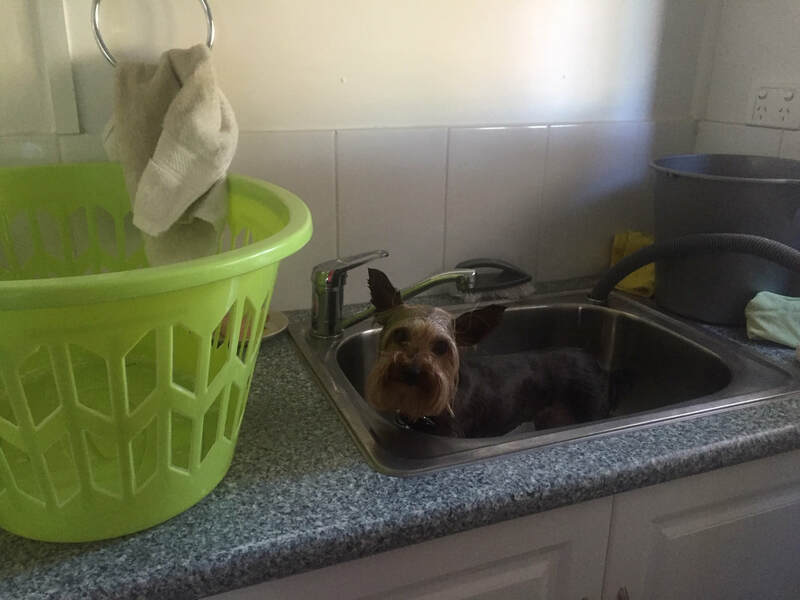 The good news about transporting a dog from New Zealand to Australia is that there is no quarantine for pets from New Zealand. The main reason for this, I suppose, is because New Zealand is so busy being clean and green. And it has way fewer pests than Australia overall. No poisonous spiders. No snakes. No termites. No biting ants. And so on. So we got to pick Peyton up the same day she traveled. There was a time when I spent every available moment researching how New Zealanders immigrate to Australia. Now we're here. When I look back, it seems awfully hectic. But we're still here and settling into our beautiful new home in Queensland. 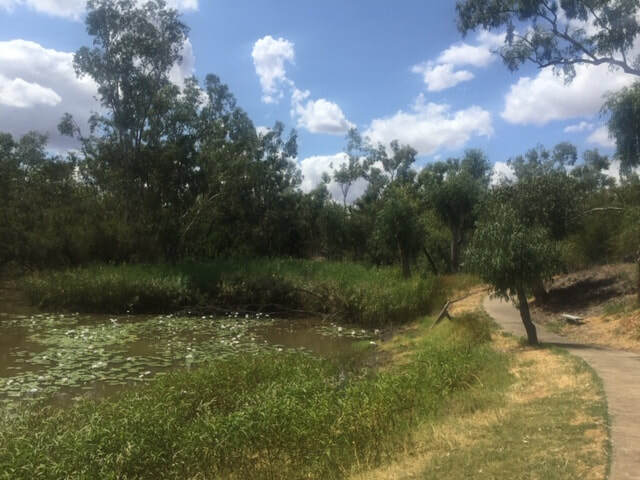 The view next to Charlie's Creek in Chinchilla. This is probably going to sound terrible, but I actually don’t remember all that much about the time period in which I wrote this book. Perhaps that’s because I spent more time in my imaginary world than in the real world around me. I’m aware my older sister was dating the man she was going to marry. I was working as a self-employed music teacher and wrote book six directly after finishing Consort parts one and two. So when I came to write this article, I struggled to remember the thought processes that led to the story. The first major event in the story is, of course, the discovery of the dragon. My very first dragon experience was the movie Elliot and the Dragon. This movie is about a boy and his invisible pet. I adored it and used to watch it at my Dutch Oma’s house. The idea of being able to have a huge protective friend all to myself - the idea of potentially being able to fly with this friend - was irresistible. As an adult I’ve come to adore the movie How to Tame Your Dragon. This story is brilliantly creative with its world building and its portrayal of dragons and their behavioral patterns. I’ve read very few books where I’ve actually liked the portrayal of the dragons. Eragon just didn’t do it for me. It didn’t help that Christopher Paolini writes a female dragon in precisely the way a male would suppose a female might speak. The whole thing felt incredibly unauthentic. Anyway, this is all to say that while I’ve written a serious story with Consort, I’ve also incorporated some of my favourite, most loveable concepts of dragons, which I’ve taken from stories that I delight in. In the meantime, King Robert’s and Queen Arlene’s failing marriage and dysfunctional family life was largely inspired by scenes from The Forsyte Saga. You should read it sometime. One of the most depressing masterpieces out there. Rafen’s trial was difficult. If you’ve ever felt accused, though, you could probably write a pretty good trial scene yourself. We’ve all had those moments where we’ve done the best we could, and it’s still come across wrong. Imagine defending yourself in one of those moments, and you’ll see how I wrote some of this scene. Perhaps one of the most fascinating elements of this story, for me, was Rafen’s spreading curse - the black injury that the Lashki afflicted him with in book four. I’ve had Raynaud’s disease for a number of years now. At one stage during my teens, I remember noticing that the numbness had begun to spread to my lower legs in winter. When you’re already losing circulation in your toes and fingers, it can be rather terrifying to notice that you’re beginning to lose it in your lower legs. I’ve also had my hand turn black before, when Raynaud’s has been at its worst. Cleaning the shower with freezing cold water in the middle of winter is never a good idea with a circulatory disease. Anyway, no prizes for guessing where the depiction of Rafen’s curse came from. But trust me, I made it far more dramatic for the purposes of the book. I let my mind run wild with the idea. Anyway, there are a few nuggets for you as you read this book - some of the secrets behind its creation. I hope you enjoy Consort! To buy this book, follow this link. To sign up to the author newsletter for future releases, click here. The Big Melon in Chinchilla on Wednesday night before the influx of tourists. Well, it's been another week or so here in Queensland, and my love for this place continues to grow. The countryside is beautiful, and the town feels like home already. The heat is pretty consistent. Last week on Wednesday, it was forty-two degrees. I survived the day, but my work printer - for music teaching - did not. Unfortunately, the studio that I normally teach in climbed to about forty-five degrees before I moved from the dining room to there and flicked on the air con to begin teaching. By this time, it was already too late for my printer. The fronts of the cartridges had melted within, and all the printer wanted to do was repeatedly groan and flash its version of hazard lights at me. So that was frustrating. This Wednesday, it's going to hit forty again, and I will be keeping my printer somewhere other than that studio. ​Over the past weekend, my fifth book released. I'm looking forward to when it arrives in the post and I get to hold it and put it on the shelf with my others. We've also put Rafen, book one, on sale for a dollar. So if you want a cheap read, it's there, and it's no more expensive than throwing a coin at a street musician. Other things happened on the weekend too. It was Chinchilla's famous Melon Festival - their twenty-fifth anniversary too! Thankfully it was only thirty-four degrees outside, so it wasn't a bad day to walk through town and watch the parade. Numerous floats came down the packed streets - and I mean packed: it was like Brisbane CBD for a day. A lot of tourists came to see it. The floats were decorated with... you guessed it, melons. But they were also festooned with green, red, and pink decorations. People dressed up and had a ball. A whole fleet of vintage cars drove down the street. And hundreds of market stalls sold all kinds of things (not just melon-related either). The day contained a number of events, some of which we glimpsed, and others of which we gave a miss because we had to drive to Dalby to get some help with our printer. You would be amazed how many things you can do with a watermelon. For instance, the Mad Dash for Cash - a race in which the competitors charge down the main street and back, clutching a large watermelon each. When we watched this, someone dropped their melon by mistake, and it smashed on the asphalt. They were sadly disqualified. There's also Melon Bungy...??? And Melon Skiing, which is famous. We got to watch the set up process for the Melon Ski. Helpers spread a long tarp down on the field and slosh huge buckets of overripe melon all over it. Sometimes someone just runs out of nowhere and hurls a water melon at the track, where it smashes and dies in a spray of red flesh. I managed to get a picture of the warning signs around the area. Notice the emphasis on "there will be injuries". Everyone falls over in this event. It's kind of to be expected when you stick your feet in watermelons and then get pulled top speed down a tarp with more deceased watermelons smeared all over it. The night before the weekend, they also had the watermelon Weigh In. 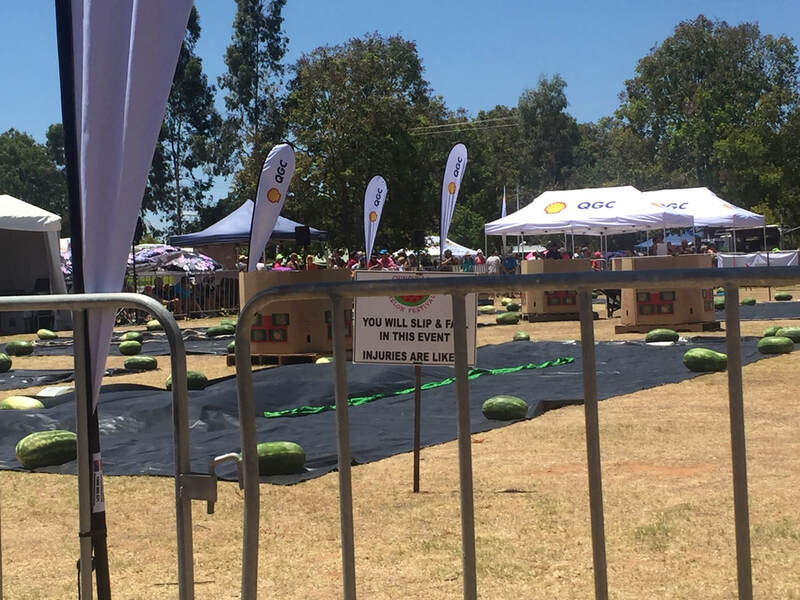 We didn't witness this competition, but I've heard the watermelon this year was the biggest ever: 100.5 kilograms. How you grow a watermelon that big, I shall never know. Steroids? And do you eat it afterwards? Or smash it on a tarp? Your guess is as good as mine. Later in the afternoon, we headed an hour down the road to Dalby (a town of 15,000 people instead of the 6,000 we have here) and got some help at Harvey Norman. We probably had some ulterior motives for getting out of Chinchilla. Unfortunately, the water mains broke down partway through the morning that day, so the entire town was without water. Imagine 10,000 extra people all needing to go to the toilet when the water mains are broken down. Additionally, just washing your hands or getting a drink becomes a problem. I had luckily put some water in the fridge earlier in the day, so we had that when we came home for a bit. But other than that, it's a bit hard to know what to do when so much of your life requires water and there is none. So Dalby was a good option until the water came back. The man at Harvey Norman removed our damaged cartridges from the printer, and now we're waiting on new ones. Excitingly, on the way there I saw a twister of red loam soil in a nearby field. These occur quite often in the dry conditions, apparently. I was mesmerized. In the meantime, I've gained a few more music students and hopefully sold a few books over the weekend. Things are slowly coming together for us here - my husband's medicare card arrived and the woman who rang me from medicare finally believes I'm an Australian citizen (long story which I'll tell maybe next time). So my medicare card should be coming soon. And on the weekend, we relax at the Weir. We've found a branch of the waterway that the motorboats don't go down as much. There, the pelicans, cormorants, and kangaroos gather, and we enjoy a leisurely paddle, watching them. "You will slip & fall in this event"... good to know. Our medicare cards hadn't come through yet, so it wasn't the wisest option for us! Have you ever had to create a really good-looking image from something in the public domain? If so, you will know the sort of struggle my cover artist Ruth Germon experienced when she came up with this one. For a start, there are basically no good dragon images in the public domain. Check for yourself. Everything is copyrighted. The reason for this is obvious. You can’t just go out and snap a picture of a dragon and stick it on the internet. That’s why there aren’t heaps of them floating around. Dragons have to be drawn or animated. And this means that people are going to copyright their images. So when I said to Ruth that I wanted a dragon on the front cover of this book, I may have scared her a little. I certainly scared myself a little, but I knew Ruth was capable of miracles. And if she decided she wasn’t up to it, we could always have left the cover blank and said the dragon was invisible like in Elliot and the Dragon. Just kidding. Anyway, Ruth found a very ordinary image to use - a dragon statue, probably photographed somewhere in China. It was obviously stone and really only contained the front claws, neck, and head of the dragon. Then a pedestal sat beneath the structure, making it look like… well, a statue. Ah, the power of editing - Ruth’s editing, that is. Would you have guessed that the silhouetted dragon depicted on the cover is a statue? Probably not. When she was finished with the cover, I nearly forgot where the original image had been sourced from. Add some flame here and some texture there, pick a good background colour, and ask Tristan to animate some lettering in Captain of the Pirates font, and there you have it - a brilliant cover. Once again, Ruth and I went for a simple central image against a striking background. But thanks to Ruth’s ingenuity, it paid off. To create covers like that, you really have to be able to see the miraculous in the everyday. It’s an artist’s gift. The next time you see a statue of a dragon, you may not think of it the same way! Purchase this brand new book here. Alternately, start the series with Rafen, marked down to a dollar today! Want to know more about these books? Sign up to the newsletter here. A wedding pic, with my sword pendant necklace. With the release of Consort, Part One, I wanted to share a little of who I am with my audience. Those of you who have found this website may already know a bit about me. My name is Yvette Kate Willemse (Y K Willemse on the covers of my books), and I’ve been a serious writer for a long time. I started writing my first book at age ten. That book is now published. Rafen is the finished product. I literally rewrote the book five times before I got it published. Additionally, I was rejected about forty times by various publishers and literary agents before I secured a publishing contract for the book and its sequels. When I was growing up, there were only a couple of things that I knew for certain about my life. One of them was that I was going to be an author. I seldom questioned this fact until I came to the age when I began to write large projects. At that time, there were plenty of people who would give me their opinion on what I was doing. Some were positive. But the vast majority of them were either negative or incredulous. I mean, let’s be honest. If you see a ten-year-old writing a book, you’re hardly going to believe that book will be internationally published one day, right? I believe it now. When I teach creative writing, and I see my students writing enthusiastically, I remind myself to be constructive, but to be kind and respectful. You never know which child might be a published author one day. The power of the published written word is actually huge. I might not have a big audience, but I do have an audience - and anyone, the world over, can access my work and read it. People can find out about what I believe and some of the things I’ve experienced almost without trying. I could say anything about anyone, and someone, somewhere, would find out and perhaps even take my word for it, because I’m an author. So in short, when a child tells me their dreams - whether they’re literary or not - I always allow the possibility that this thing could really happen. I choose not to doubt immediately. I choose to believe in their capabilities and determination. At age sixteen, I was published for the first time in a national anthology printed in New Zealand. This was an incredible experience for me, and it took me one step closer to the experience of publishing my own books. At age eighteen, Pontas Literary and Film Agency signed me on as their youngest ever client. They represented me internationally for an agreed period of two years, during which time they found me my publisher. When I signed the literary agency contract, a few more people began to believe that what I was working on might actually happen. But two years is a long time to wait, and after several rounds of rejections, even I was doubting whether I could get my own book published. One thing kept me holding on - God. I was convinced that if God had placed this desire in me and given me such a wealth of ideas He could get these books published - if He wanted to. I kept praying about it and kept writing. I might have thought that my books could do some good in the world. But I didn’t realise that they were doing me good first and foremostly. Due to some painful experiences in my childhood, I had a lot of baggage. Writing The Fledgling Account enabled me to process what it means to experience pain and still believe in a good God - what it means to have your innocence shattered and still be a child - and what it means to want to do good but to always feel filthy and ashamed. I hope that The Fledgling Account can help at least one person who went through something like what happened to me. If it does, these books have achieved their purpose. At age twenty-two, my first four books were published. It was the weirdest experience to hold my first book in my hands. I walked out of a music lesson I had been giving a child one night to discover my client sitting in the waiting room, reading my book. This was actually very ironic, as I had not yet received my copy of Rafen, which had just released. I begged her to let me hold it, which she willingly did. She even photographed me. It was a crazy experience. I think I found it most strange to flick through the pages and see something that had once been a moving, developing Word document rendered official. After my first four books were published, I experienced a taste of both local and national fame in New Zealand. 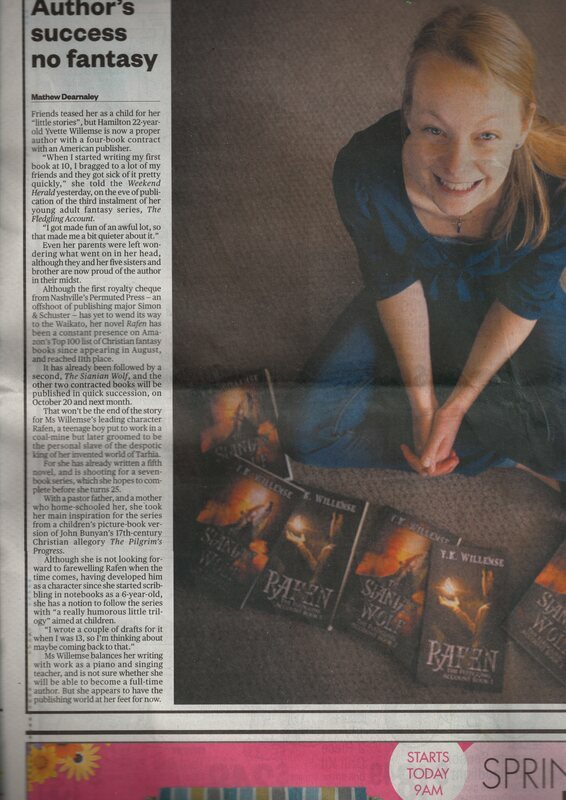 I was interviewed for a group of newspapers, which culminated in a large article about me appearing on page three of the weekend Herald - New Zealand’s most widely read newspaper. Radio Rhema, a highly influential Christian radio station in NZ, interviewed me too. My books went into New Zealand public and university libraries. I spoke at Hamilton Book Month once and presented at several schools. But when you’re not getting anything else published, things slow down, which they inevitably did. Fame only lasts as long as you’re interesting, and it’s hard to be interesting all the time - not to mention that it’s tiring. Additionally, I was growing older, which meant that I was no longer a prodigy. A twenty-year-old signing a publishing contract is unusual and exciting. A twenty-two year old with four books out is out of the ordinary. But a twenty-five or twenty-six year old with five books published - diverting I suppose, but no longer prodigy level. I’m not particularly worried by this, although I admit that it once concerned me. You know what it’s like - you succeed big time at one thing and then feel the pressure to top it again and again to keep up the status. I’ve come to terms with why I felt that way though, and the personal shame and low self esteem that sat behind that attitude. I don’t feel any pressure to prove myself in this way anymore. I write because it’s a core part of who I am. It’s how I understand the world and process it. Additionally - without meaning to flatter myself - I have a very quick, active mind that can swiftly turn to hyper anxiety if I’m not careful. My mind is constantly jumping ahead and working out the consequences of numerous actions and events. It imagines what might happen if “x” occurs and then spirals out of control. In short, it’s a survival machine. And the best way to slow that down is to write it out. Because of the way I’m wired, I’m able to write fast-paced, thrilling stories. That’s a gifting I have. If I don’t write, my gifting turns in on itself and becomes a problem. It’s like a muscle I need to exercise to stay healthy. Some people don’t understand this and might even think I’m being dramatic. But stop and think about it. We all have idiosyncrasies that could become huge problems if we don’t develop a healthy way of working with them. So here I am, with another book nearly published and more on the way. And books will probably always be in my future, in some way or other. I know that even if few people read my work, it’s doing some good in my immediate circles anyway, because it’s making me a healthier, more responsible person. And that does good to those around me. But I hope that because you’ve taken a moment to read some of my story, you might consider reading more of it in one of my books. Take a trip, have an adventure - it’s on me this time. 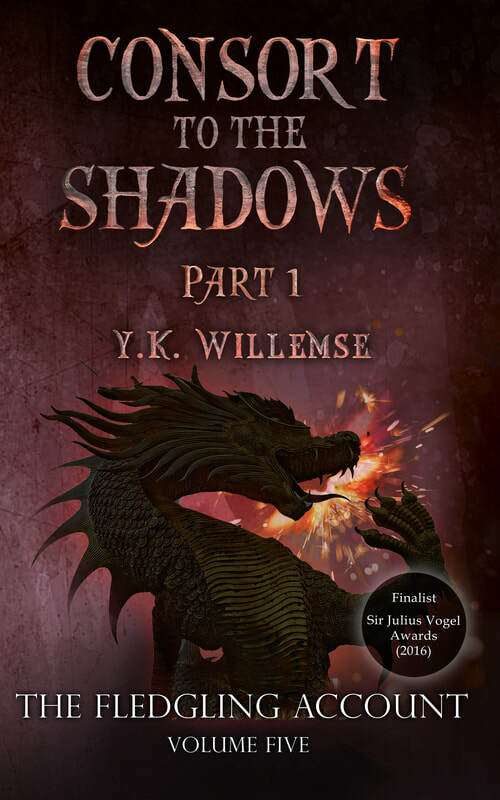 If you want to sign up to Y. K. Willemse's author newsletter so that you can receive the notification when this new book releases, please follow this link. Clipping from the weekend edition of the New Zealand Herald, back in 2015. Friend or foe? Dragons have been a fascination in legend and literature for centuries. Consort introduces a few new characters to my readers. Experienced readers of epic fantasy will know that this particular genre specializes in a huge array of characters, which can sometimes be mind boggling. I hope that Eil will prove memorable. Dragons of any sort have fascinated people for centuries. This picture was actually from an advert prior to World War I, calling young men to battle. The foe was depicted as a dragon. In Consort, dragons are both friends and foes. Fire Daemons were so named because of their lethal flame and unpredictable temperament. They are the only type of dragon in the history of the Mio Pilamùr to never have been tamed by man. Fire Daemons are also one of the smaller variety of dragons. They are only the height of two grown men, and their wingspan is the length of three. Considering that some dragons can be as tall as the turret of a high-reaching palace, Fire Daemons might not sound very impressive. But Fire Daemons have two unique gifts: their eyes and voice can hypnotize their prey, and their flame is both highly explosive and repugnant to other dragons. While many dragons are not harmed by fire, they are still susceptible to the flame of the Fire Daemon. This sets the Fire Daemon apart. As a Fire Daemon grows older and becomes more experienced, it is capable of blowing up a stone wall with a couple of explosive sparks, or nearly suffocating another dragon with its flames. The hypnotic powers are present from infancy. Eil hatched from an egg that Sherwin found in the Cursed Woods when he was fifteen. Sherwin buried the egg at an old campsite and dug it up at age seventeen, in book five. And that was when Eil chose to hatch. All dragons have the power of speech, but few speak to people, regarding them to be too dense or inferior to hold conversation with. Eil knew he was among equals from the beginning. With Sherwin and Rafen caring for him and flying with him, Eil quickly became one of the most talkative dragons alive. Rafen had never thought of the dragons having their own stories and traditions—their own conversations—let alone waiting for him with eager anticipation. Eil threw back his head and made a loud, cawing sound, like a large, masculine crow. Rafen took this to be a laugh and found it infectious; he couldn’t help laughing, too. Eil is intensely aware of his special giftings, even if he doesn’t have full command over them yet. When the ruler of Zal Ricio ‘el Nria comments in shock that Rafen’s dragon “talks to him!”, Eil reminds the Zaldian chief of the other things he can do too. Eil turned his head to Obed. The chief quailed and wouldn’t meet his eyes. Eil threw his head up and writhed in self-satisfied delight. Rafen held his own ribs so he wouldn’t crack them. Eil turned his head and spat a combination of saliva and sparks onto the ground. A fire shot up like a jet, and Rafen surged forward to absorb the flames. The chief bowed in response to this explanation, obviously too disquieted to reply. Later in Consort Part One, Eil and Rafen must face the enemy dragon rider Tirok in public battle. While Eil seems confident, Rafen is understandably nervous. “MY LORD FLEDGLING, GOOD DAY FOR A FIGHT IT IS, YES, YES. SMASH TIROK. SMASH ’NAZ, HIS DRAGON,” Eil bellowed. It is possible that Eil is about to prove what he has always known: that he is the best dragon alive. And Rafen will prove what he has always known: that he is the Fourth Runi, and he is equal to any challenge. 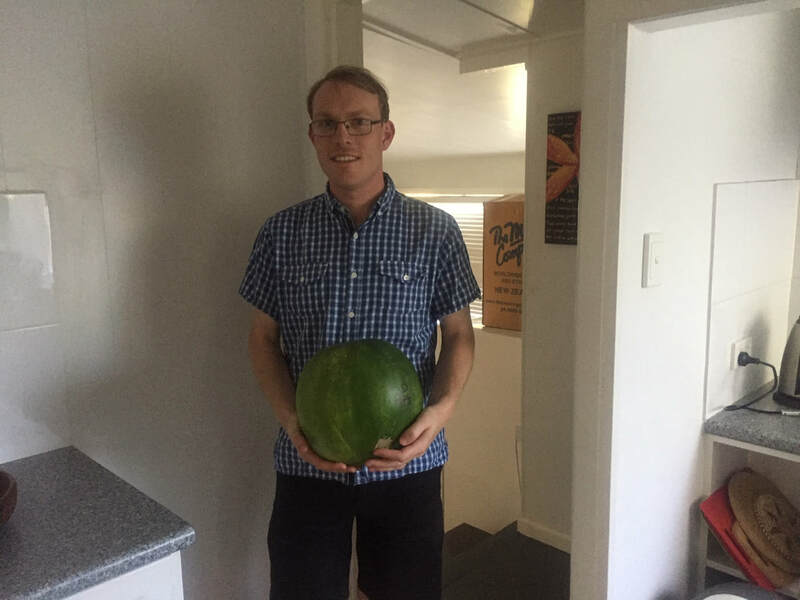 My husband holding a proper watermelon. Well, this past week has had some fantastic developments - the first of which is that we have internet properly installed! Hooray. Now I can do my writing and blogging from home instead of in the library. "Hello, this is Yvette, and I wanted to call about--"
"Sorry, I can't hear you. I can't hear you - are you there?" "I can't hear you, sorry, I can't hear you, are you actually there?" Ugh. We rang them up from two different phones, and every time we had the same result. This was because their phone line was being updated, apparently. (Is "updated" code for downgraded?) In the end, I complained in a comment on their Facebook page, which got a response very fast. And now we're connected. 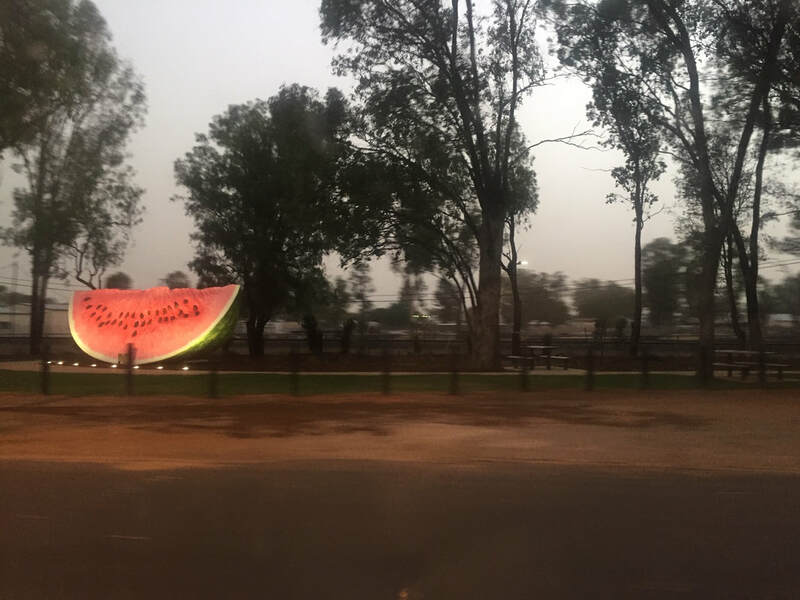 In the meantime, everyone in town is eating watermelon, which I suppose is unsurprising as this is the watermelon capital of Australia, and they do have a massive model slice of watermelon at the front of town. (I keep wanting to take a picture with said slice, but because the melon festival is coming up, the local council is very protective of it. They've fenced it off with orange netting and even sometimes set a couple of watchmen/workers over it.) Watermelon was sixty cents a kilo the other day at the farmer's market, so I picked up a ten kilogram monster. I keep telling my husband we're eating so exotically here, with all the dragon fruit, rock melon, and watermelon. He pointed out that the word "exotic" implies foreign, but we actually live here now, so it's not exotic. And because we live here, we've discovered that we've been eating watermelon wrong our whole lives. For a start, the locals told us that you have to get the round ones that aren't too big or too small. They should be the ones that have zero black seeds. Apparently, the football shaped black-seeded watermelons are a necessary evil with the breeding process, but they're not good to eat. Well, blow me down, because until I moved here I have only ever eaten football shaped black-seeded watermelons. The Australians I was talking to on this occasion informed me that it was because those particular melons weren't considered good enough for consumption or even for smashing at the melon festival. So they sent them to New Zealand. This was, of course, a joke. But they still seemed pretty pleased about it, and I suppose it is kind of funny living across the ocean from a country that is consuming all the worst melons and remaining completely ignorant about it. So, my apologies, New Zealanders: many of you have never eaten a proper watermelon in your lives. I also bought some tomato plants this past week, and I planted them in three different places in the back yard. Unfortunately, four died miserable deaths. I couldn't even see them when I went out to water them the next time. I assume the sun just gobbled them up. The other four are still hanging on. I planted them in the shade. Who could know you could have too much sun? Apparently, this is the perfect weather for snakes. Someone a kilometer down the road from us had a brown snake (an innocuous name for the deadliest serpent in the world) in their backyard the other day. It slipped away, but that means it (and its invisible cronies) are still on the loose. So I'm wearing proper shoes and socks out there, despite the heat. In all honesty, you could pretty much believe yourself somewhere much more ordinary than Australia most of the time. 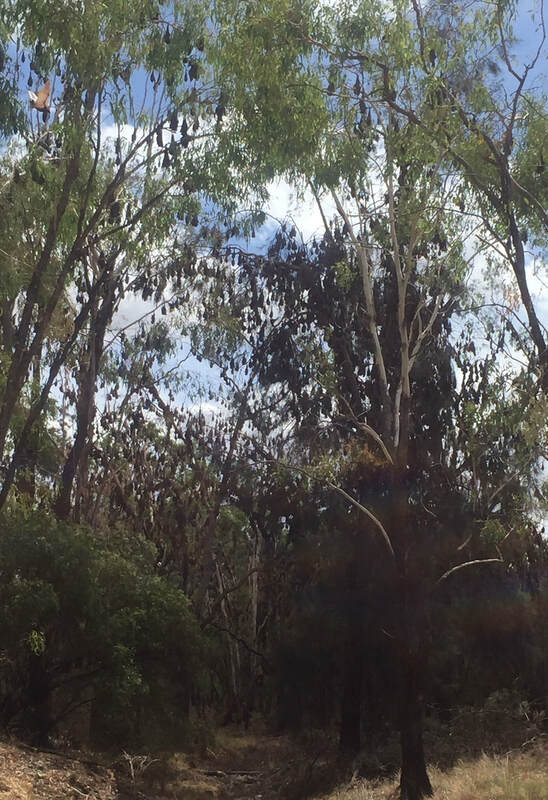 Obviously, there are parrots and crows and the occasional fruit bat. But the only unusual things I see daily are skink lizards and flying cockroaches (I prefer the lizards). Now and then, you'll see a kangaroo at the Weir. But the grass has gotten so long where they graze that they're mostly hidden. And I wouldn't want to walk through it unless I magically transformed into Steve Irwin. I know I haven't seen any snakes yet, but I'm not fooled. They're definitely out there. Although, I'm saying all this while our house still has some form of pest protection on it. When that wears off, I may see more unusual things. We went to a friend's place for dinner the other night, and they were talking about red backs (poisonous spiders that are essentially the Australian version of the black widow). "Do you know, our house had a red back infestation before we had it pest treated? I was trying to put my USB into my computer and it wouldn't go in. And when I scraped out the port, there was a very sick red back!" "That's not too bad. We knew some friends who had a red back infestation so bad, they were just dropping into the baby's cot, ha ha ha!" I used to live in Victoria in Australia where we were told red backs could kill you, so don't go rummaging in any wood piles without gloves, etc. In Queensland, people don't seem to have that much of a problem with them. Still, I can't imagine myself cheerfully going "ha ha ha!" if red backs were dropping onto furniture in my house. One day, maybe, I'll be a true Queenslander. By the way, just before I sign off - you know those beautiful pictures of the Whitsundays towards northern Queensland? Apparently those are taken during winter. In the wet season over summer, you sometimes don't see the sun for six weeks. And you can't really go swimming either, because the stingers (box jellyfish) and crocodiles are out and about and looking forward to meeting you/preying on you. So I think we wound up in the right place in Queensland. I love it here. But then again, we've seen nothing but sun for the past ten days!